Sites We Like < It’s Not Too Late to send your Critter Carols! It’s Not Too Late to send your Critter Carols! No time to send out a bunch of holiday cards? There’s still time to send Critter Carols, the fast, easy and unforgettable season’s greeting starring your pets! Or you can use one of the cute dogs or cats that they have uploaded for you. There are provided “barkup” singers already in place to make your furry trio or cat-tet come to life! And since they are free, there’s no limit to the number of customized Critter Carols that you can send to all your friend and family. You get to choose a song that matches your message, either Jingle Bells, Deck the Halls, or We Wish You A Merry Christmas. 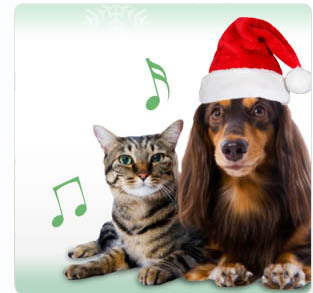 The holiday tunes are barked or meowed when your recipient views the card and the custom message you’ve typed in for them to see. We found our pets came running in to see what all the fun was about! Critter Carols are available here on Petcentric, and are brought to you by Purina, one of Adopt-a-Pet.com’s sponsors that makes our pet-saving service possible. Happy Pawildays! !